Friendship is all about being a smiling face and a safe place, brightening someone's life and bringing back the warm and fuzzy feelings. 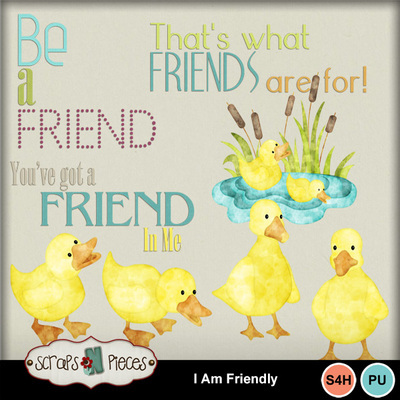 I Am Friendly celebrates the joy of spending time with your closest friends. This bright, cheerful color palette matches the color and sunshine returning to the world after a long winter – spring greens, sky blues, rosy pink, sunny yellows and oranges too. The elements are perfectly spring-y as well, with cute ducks, blooming flowers, and fluffy clouds as far as the eye can see. Playful patterned papers, banners and ribbons galore, friendship-themed word art, and a bold skinny alpha will bring a smile to your face. 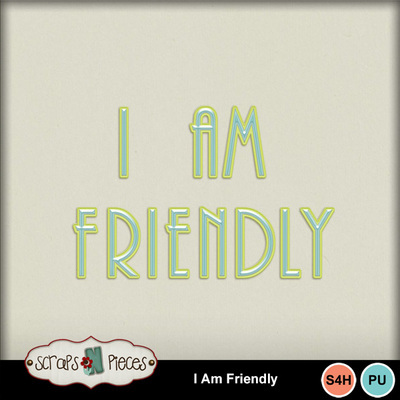 So enjoy the bloom of springtime with the people who bring sunshine to your life, then scrap those warm fuzzy feelings with I Am Friendly.